While it was only a five week term, I'm so glad the Easter holiday' are here and I have two weeks off to relax a little and de stress before heading back into the final stretch, before stressful resits and before A level exams. Having said that,I don't think much relaxing will be done; I really need to get stuck into my revision and if you have any exams coming up to I think you should to! I haven't been very active on my blog due to revision taking over so I thought why not share some of my revision knowledge with you- a week long feature that will help some of you. Starting today. 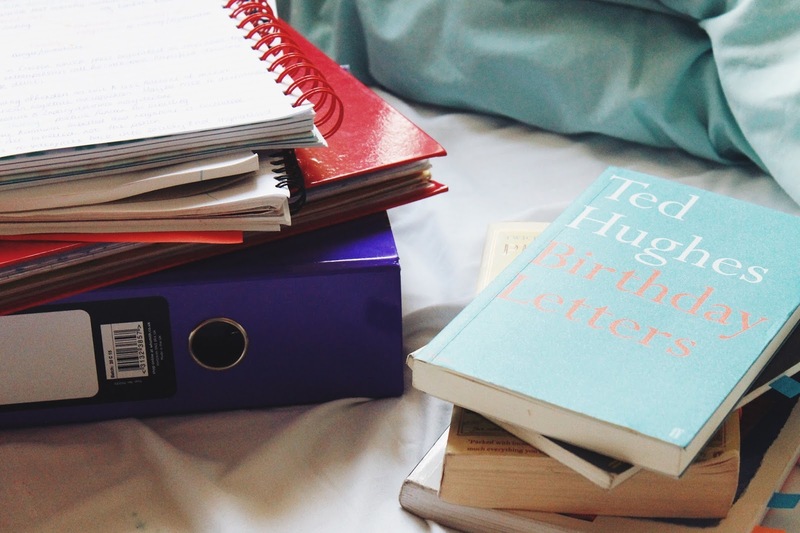 Getting started on the mountains of revision you need to do can be daunting and so, to give me and you the push to get organised and cracking on revision, I thought I'd share with you a few ways to get started. Clear a space. Find somewhere quiet and uncluttered to revise. If you're having trouble finding somewhere, give your room a tidy and sit on your bed; this isn't recommended as it's best to do it somewhere else other than where you sleep but if you're most comfortable there by all means revise from the comfort of your bed. Personally, sitting at my desk help me get in the zone and I tend to be more productive. I usually find, if I cant concentrate it's because my surroundings are messy so give your room a quick tidy and you'll be ready to go. A tidy room is a tidy mind! 2. "WHAT DO I NEED TO DO?" It's very easy for me to dive in and get cracking on revision only to find I've completely forgotten about something I've needed to revise. I'd recommend writing a list of all the subjects, topics, sub-topics you need to revise and decide how you're going to revise for each section. I'm going to do another post on Revision techniques over this next week so keep an eye out for that but if you've seen this and want to get started now, here's some old posts of mine on revision techniques here, here and here. Don't go in all guns blazing because after a day or two you'll get sick of the sight of your textbooks. By doing half an hour of a subject each day to start with and building up to revising in bigger chunks is a great way to build up a tolerance to getting more done. I also find that once I've done half an hour I think "I might as well finish this section" or "well, I'm settled so I might as well do another half an hour". Soon enough your revision for the day will be done and you can take some well deserved time relaxing with a face mask and watching Netflix. Wow, that sub heading makes me sound like a cheesy American advert but the premise is true. Make yourself a calender a few weeks in advance and add the times you have things on such as work, youth group etc. then allocate time to revise each topics. If you're like me and you have frees during college time, plan what you're going to revise then so you can make sure you have what you need prepared. Try and do an hour or two every night before you do anything when you get home from school or college. That way, you've not relaxed and you're still in a learning mind set. 5. GET GOING- START NOW!!! If you have exams coming or a big test approaching take this as your sign to get revising! Even if it's next week it's never too late to pick up a text book and start revising. If your exams are like mine and are from May-June this is the perfect time to really focus on revision. Of course, take a break, have some me time before the pressure hits, but this is the best time for you to start studying! I'm carrying on the revision theme of posts every day for the next week so I hope your enjoy them and find them useful! Have you got any big exams coming up? Have you started studying yet?